Wire routing is the problem of determining the physical locations of all the wires interconnecting the circuit components on a chip. Since the wires cannot intersect with each other, they are competing for limited spaces, thus making routing a difficult combinatorial optimization problem. We present a new approach to wire routing that uses action languages and satisfiability planning. Its idea is to think of each path as the trajectory of a robot, and to understand a routing problem as the problem of planning the actions of several robots whose paths are required to be disjoint. The new method differs from the algorithms implemented in the existing routing systems in that it always correctly determines whether a given problem is solvable, and it produces a solution whenever one exists. Michael Gelfond and Vladimir Lifschitz. Action languages. 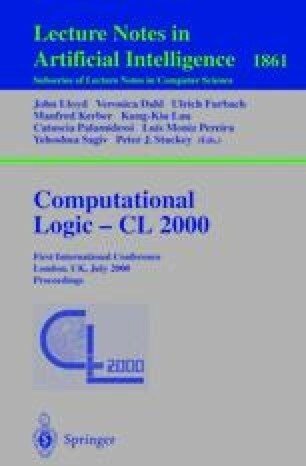 Electronic Transactions on AI, 3, 1998. http://www.ep.liu.se/ea/cis/1998/016. John McCarthy. Elaboration tolerance. In progress, 1999. http://www-formal.stanford.edu/jmc/elaboration.html.